So where are we off to once we finish this boat? It's something we've been talking about a lot recently, and something we haven't talked about much on the blog yet. We've been too bogged down with boat work (and fear of failure) to make any meaningful plans. And that's still largely the case. But I'll share our recent musings on the topic. First of all, there is no plan per se. We are not really planning a trip around the world. We are planning to be nomads in order to eventually see as much of the the world as we can. I think the term "travel" and the phrase "sail around the world" can be misleading because many people immediately associate them with permanent vacationing. Which is where I assume all the "but you can't possibly" "how can you afford?.. ", "Well if you stop to work you're not really continually traveling are you?" questions and accusations come from. And they are right. You can't permanently vacation. 99% of us can't afford an extended world tour with our current account balance, and living/working in a foreign land isn't exactly traveling in the vacation sense. So I understand the protest, never the less it's surprisingly difficult to break the "vacation" interpretation of travel and explain nomadic life to a lot of people. That home is where the boat is. We do not want to visit anywhere. We want to live everywhere. We call people with this inclination drifters, vagabonds, long haired pinko commie scum, gypsies, nomads...travelers. I believe a person becomes nomadic for two reasons. 1. They must see the world. 2. They can't afford to. Rectifying this seemingly mutual exclusivity inevitably leads to nomadic life, whether by bike, boat, backpack, RV, planes, trains, automobiles, or working abroad. Those who must go go, and worry about the rest when they get there. They rightly have faith that the good people of the world won't let them starve. They do not identify with or need a home base or home culture. "Whereas the tourist generally hurries back home at the end of a few weeks or months, the traveler belonging no more to one place than to the next, moves slowly over periods of years, from one part of the earth to another. Indeed, he would have found it difficult to tell, among the many places he had lived, precisely where it was he had felt most at home." When I first found a copy of The Sheltering Sky long ago, I was mesmerized by the sense of timelessness Paul was able to impart through his storytelling. He captured the infinity of the slow travel experience. Cesar was onto the cause of this phenomena. "Traveling is a brutality. It forces you to trust strangers and to lose sight of all that familiar comfort of home and friends. You are constantly off balance. Nothing is yours except the essential. All things tending toward the eternal or what we imagine of it." I believe this feeling, this pace of life, this possession of your own time, is the proverbial dragon chased by nomads, drifters, and travelers. AJ and I were hatching the plan to turn nomad before he was stationed in Germany. But living there for 3 years and getting a taste of life abroad nailed that plan down. You either enjoy culture shock and navigating new and different ways the world can be run, or you don't. You could say AJ and I are addicted to culture shock. So the plan is simply to drift from place to place lingering where custom and culture eludes or inspires us until we've seen it all or tire of it. It may not all happen on S/V Robin, or even on a boat, but that's the 20 year plan. Where to go first has been an ongoing discussion for years. The Bahamas and Caribbean will be first by default. But once we have our sea legs do we go to the Atlantic or Pacific? The Atlantic is smaller, and on the other side are the familiar comforting western cultures of Europe ripe with marine support. But there's also a lot of bureaucracy, fees, fewer work opportunities, expensive western goods. All the expenses of western world. So it may not be the best place to start out. Plus, we just came from there. So to the Pacific! But if I'm going all that way across the South Pacific to that side of the world, I'm not missing India or Japan. Seeing all of Asia that I'd like to, would basically force a Pacific loop. Sending us back to North America from Japan, then through the Panama canal into the Caribbean and maybe then over to Europe. 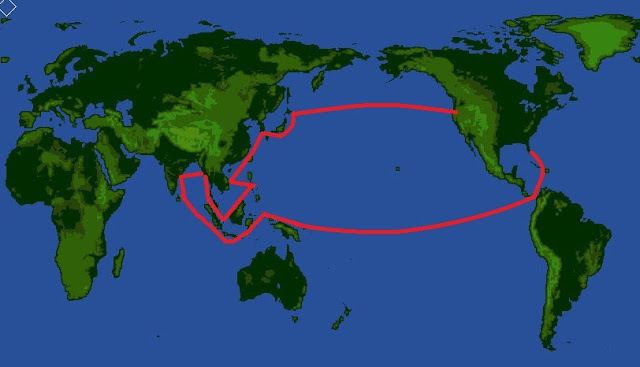 The only thing this route excludes is the South Pacific. Which I hear is pretty ... empty. This plan really excites me. Practice a little Spanish, Portuguese, and Salsa, Then our first ocean crossing ends in African safari. Then Baobab trees, swimming with Asian elephants, stopping by the Cheoy Lee shipyard in Hong Kong to say "what's up? ", getting down with whatever the Japanese and south Koreans are doing these days... Then back to North America, through the Panama canal and up the eastern seaboard to Nova Scotia. Then across the north Atlantic to the Europe we haven't seen: Ireland, Scandinavia, Portugal, Greece, Istanbul. Stopping everywhere in between of course. Or, after sailing Scandinavia we could trade the sailboat in for a riverboat and take the Rhine-Danube river system to the Mediterranean. Or maybe we will fall in love with some place along the way and decide we were meant to be farmers. Or restaurants or carbon fiber fabrication-ists or documentarians, or tree house dwellers, or start a non-profit... Or maybe we'll build our own self-sustaining island out of plastic water bottles, bamboo and dirt like that guy in Mexico. And add some floating shipping containers full of dirt strung together for farming. Get some chickens. Or end the voyage and decide our hearts belong to the grey skies and rocky shores of Ireland. ...or maybe we'll end up begging on the street in an exotic local for a while, or shipwrecked on a desert island, or get crushed by a depressed whale, or maybe we'll find out the mysteries of the Bermuda triangle never to be heard from again. I love the idea of traveling as a way of life. I think both my kids will end up doing that for an extended amount of time. Our son is currently on his third trip through Europe, but he's still in college so I think he's still considered a 'tourist'. Our daughter is older, just quit her job and is planning to go to Scotland for 6 months, then to where ever, for however long, and make it work. Seems like there is an entire infrastructure of young adults who travel the world and support each other in their travels. It's amazing. You guys have a great plan. Great post! I love your whole mind set when it comes to travelling and the freedom your plan offers. Good luck with your boat work, what an amazing trip/life you will have!